The Eurozone clearly needs a structural yet flexible central bank policy instrument that can be used to kick-start the economy as and when it is needed. A miniature version of the increasingly popular basic income policy would provide exactly this type of instrument. By Willem Sas and Kevin Spiritus, originally published in Flemish Newspaper De Tijd, translation by Will Wachtmeister. Can anyone remember what times were like before the crisis? When “cut-backs” was a word ascribed to the 1990s. When growth rates were healthy and inflation stable. When the benefits of a unified single European currency were still plain for all to see. Memories of those times have been fading rapidly. Especially so with persistent wage stagnation, mounting inequality and interest rates that have been reduced to basically their lowest possible level. Is there really no way out? A policy response that is often put forward is looser monetary policy, the proverbial printing press. And since 9 March, the printing press has been in full swing in Europe too. 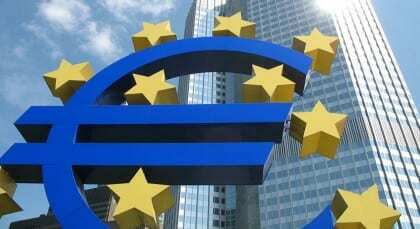 Under the established label quantitative easing (QE), the European Central Bank has, after four years of hesitating, begun spending billions on buying up assets. This involves buying up private loans just as much as government bonds. The hope is essentially that this will stimulate both private and public investment. Unfortunately, QE will not necessarily lead to more economic investment within the European Union. Insofar as public authorities aren’t able – or allowed – to invest, insofar as the financing doesn’t reach businesses and businesses don’t want to take on loans, QE will prove a fruitless endeavour. At the same time, QE could well lead to even more debt: by stimulating the economy through credit creation, it potentially blows more air into the bubbles caused by the most recent crisis. A massive buy-up of bonds and shares will in the end also cause asset-price rises, with the benefits going mainly to larger, wealthier investors. This all means that success is far from guaranteed: the approach is fraught with risks and has damaging implications for equality. QE thus does not appear to be the best way forward for Europe. This is why there are economists who propagate a more efficient alternative, the so-called “helicopter money” approach. For as long as the economy fails to recover, newly printed money is simply distributed directly to the general population, as if it were dropped from a helicopter. Research shows that the money would be spent pretty much straight after it’s received, which would restore confidence to invest among businesses. It would also restore business confidence to take on new employees, who in turn respond by consuming more. And so the result becomes a virtuous circle. But there are drawbacks. Sharing out helicopter money is a temporary measure that can only be adopted in exceptional circumstances. If at some point it transpires that the ECB has gone too far and created a threat of runaway inflation, it is very difficult to remove the newly created money from the economy. This is why there is a clear need for a structural and flexible policy measure which the central bank is able to use to kick-start the economy as and when it is necessary. A variation on the helicopter theme, a monetary basic income, provides a way forward. Under this scenario, the ECB would distribute an amount of money to each citizen on a monthly basis, calculated as a percentage of average income (the amount therefore varies between countries). Let’s assume for the sake of simplicity that the amount is 400 euros a month throughout the Eurozone. It’s important that the individual Eurozone countries remain responsible for raising the 400 euros – for example by reducing benefit payments or tax allowance levels – whereupon they pay it back to the ECB. So far, this is a neutral measure that shuffles money around without creating a stimulus. This remains the case except in times of crisis when the central bank increases the monthly payment to, say, 600 euros, until the economy recovers. Meanwhile, each national authority keeps its repayment levels fixed at 400 euros. The ECB thereby ends up printing an additional 200 euros per person per month, and this money is relatively quickly spent. As the economy recovers and growth and inflation figures rise, the basic income can be returned to the neutral level of 400 euros. In cases where the ECB had been too generous, the basic income level could even be lowered temporarily to 300 euros until inflation stabilizes. This would essentially remove money from the economy. Viewed as a monetary policy instrument for tackling crises, this type of basic income can hardly be considered an indulgence. But there is more to it than that. The approach also does what it says on the tin: it is a miniature version of exactly the sort of basic income which increasingly features in public debate. Supporters claim that a structural basic income would provide a way of dealing with automation, growing inequality as well as the stress and agitation of everyday life. It would also enable people to be more creative and entrepreneurial. This last point is far from a certainty and in effect represents the biggest drawback of a basic income policy. How many people would actually invest in new skills? And what will happen to the labour supply? There do exist several economic models that simulate the effects of minor reforms but when it comes to the effects of a comprehensive reform such as basic income, we’re very much in the dark. As long as we can’t anticipate the consequences of introducing a basic income, making a case for it will remain difficult. And because the advantages will only really be felt when basic income is set at higher amounts, introducing it step by step is just as problematic. Here our proposal for a limited monetary basic income offers yet another opportunity. To be sure, we don’t expect an amount that guarantees a dignified life to be introduced from the outset. But our proposal does allow economists to research the effects of a large income shock. When the central bank increases the monthly payment in times of crisis, this will generate a great deal of valuable evidence. As soon as the positive effects are ascertained, the neutral-level basic income can be increased step by step, eventually reaching the point of a fully-fledged basic income. So we have stronger guarantees of success, less risk, and more equal opportunities to boot. That’s a better idea than quantitative easing for a start. Willem Sas and Kevin Spiritus are completing their doctorates in public economics at the Center of Economic Studies at Belgian university KU Leuven. Helicopter money is a wrong headed but simple concept. The Central banks can only spend money into existence. They actually just mark up accounts, on the instigation from Treasury, into customers reserve accounts at the CB. When the reserve accounts in their turn distribute the money to individual customer accounts at the local branch that’s when it becomes money. It doesn’t ever get created as a saving account a source of future spending. That is because the Government owns the whole idea and can always just mark up accounts as and when needed. So the government has to get some ventures “shovel ready” and pay for each venture as it progresses. Thus it puts paid income into the economy without paying bank interest, fees, etc on the work. This boost to the economy, by deficit spending, doesn’t cause inflation- unless the output gap is filled first. You mean like ZIRP, NIRP, massive uncontrollable debt servicing and structural deficits that were all meant to be a ‘temporary measures’. No, what the Eurozone and the entire world needs is for every Central Bank to be disbanded and every member of the Central Banking oligarchy to be arrested and jailed for fraud.